A’Tower – Monsanto National Park to the west and Edward VII Park to the east – permits one to appreciate contact with nature, without losing sight of the urban lines that define Lisbon: the squares of Baixa, the reflected luminosity of the Tagus, and the unique sensation of being on top of the city. These exclusive apartments in Amoreiras allow one to live particularly: their trendy, urban, and sophisticated profile is integrated into the top of Lisbon’s skyline, granting their residents a special status. The renowned international schools such as the Lycée Français, as well as the carefully preserved stores in the busiest streets of the neighbourhood, are complemented by the luxury offer a few meters away on Rua Castilho and Avenida da Liberdade. Lisbon’s most cosmopolitan shopping mall – Amoreiras Shopping Center – is across the street from A’Tower and determines how to live on the top of this hill: with the best brands, the largest diversity of restaurants and the natural elegance of knowing how to enjoy life to the fullest. A’Tower is an affirmation, a building of modern and dynamic lines that emphasize its urban character. Vibrant and desirable, with an inspiring personality, it was created by prestigious architects Saraiva + Associados in a creative process where centrality and modernity rule. At one of the points where the city converges and from where it extends, accessibility and convenience are essential to living peaceful days of personal accomplishment. The interior design, the grandeur of the materials and the luxurious simplicity of A’Tower provide an original, safe and modern way to experience the city. The wide and comfortable balconies feature an extensive view of the city. The interiors, innovative in its materials and discreet in its simplicity, adapts to the personality of anyone who chooses to live in this space. 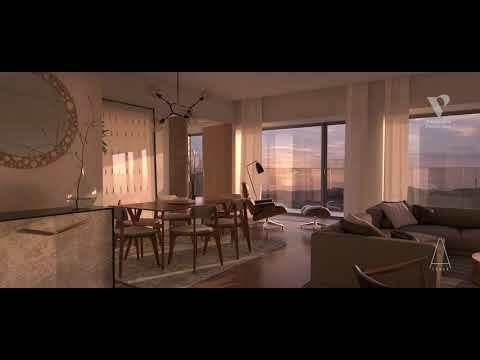 Only 34 apartments distributed throughout 15 floors ensuring the uniqueness and exclusivity of whoever chooses to live in Lisbon. With an offer of various typologies – from 1 to 5-bedroom units – A’Tower will always be a cosmopolitan residence sought by determined professionals, modern families and sophisticated people that identify with this attitude. One of the remarkable characteristics of A’Tower is its capacity to create distinct dynamics between common and private areas. While the common areas privilege the contrasts that evidence that nature of city living by juxtaposing sophisticated colours and organic materials, the private zones are exalted by the tranquillity of light tones and wooden finishings. The pool and the gymnasium stand out for the sobriety and elegance of their environments, which may be enjoyed with absolute serenity. The relaxation zone allows one to leave the urban spirit outside and make the most of the days – and nights. Pedido relativo ao empreendimento "A'TOWER | For Sale | Amoreiras, Lisboa", reference 020_EMP.